This species has a massive natural distribution. It’s been recorded from Pakistan, India, Bangladesh, Sri Lanka, Myanmar, Thailand, Vietnam, Laos, Cambodia, Malaysia, the Philippines, Indonesia, Papua New Guinea and northern Australia. Wild fish mostly feed on both terrestrial and aquatic invertebrates of various types, although small fish are also taken. 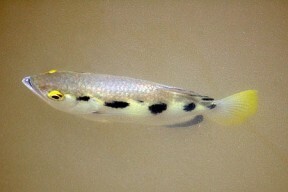 The archer fish is famous for its feeding behaviour. It has the ability to shoot jets of water from its mouth at insects on overhanging vegetation. The insect then falls in the water and is eaten! If using the paludarium setup described above, it is possible to replicate this behaviour by introducing crickets or fruitflies into the planted area in the upper part of the tank. As they venture out along the plant leaves, they will eventually be picked off by the archer fish. The fish also accepts floating foods such as flake and pellets and will also relish frozen food such as bloodworm and brineshrimp. No breeding recorded in captivity. 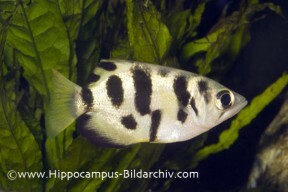 Unlike, its near cousin, t. jaculatrix, the largescale archerfish has been recorded breeding in freshwater in the wild. Vast numbers of eggs are produced, numbering in the tens of thousands. The Largescale Archerfish is one of a fascinating group of fish that have evolved this very distinctive feeding pattern. 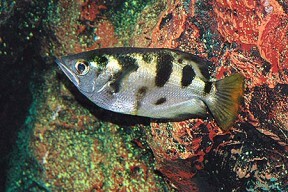 The family contains six species, of which toxotes jaculatrix is the most commonly available (sometimes sold incorrectly as t. jaculator). Toxotes chatareus is offered for sale in the UK although much less frequently.